As you drive west from Xian you pass through fertile lands. This is part of the great loess plateau-country of northern China created by the dust of ground-down mountains far to the west. It has been blown for millenia to form a layer of special soil, loess, in places hundreds of feet thick. This region is the cradle of Chinese civilization. It was here that Late Stone Age people began to develop the culture that evolved into the Chinese civilization. When irrigated, these loess soils are some of the most fertile soil in the world and are highly erodable. Although the climate has never been benign it was a desirable place to live. 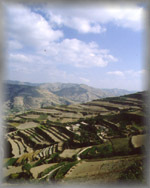 Five thousand years of farming has crafted a landscape of terraced fields which rise in ranks to the summit of every hill. 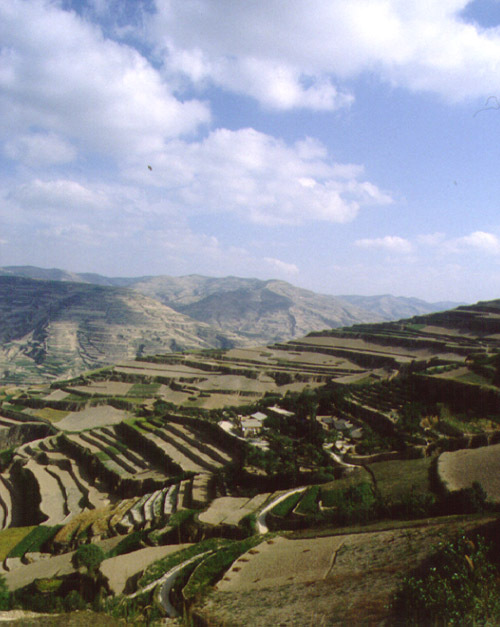 They are dissected by deep ravines and nowadays peppered with red-tiled villages. It is pretty country. It is the valley of the Wei, the largest tributary of the Hu (Yellow) river. In the 3rd century BCE the Chin dynasty created a large and efficient irrigation system, based around two large canals at the junction of the Ching and Wei rivers. This system, watered some 180,000 hectares and provided the powerful economic base for the Ch'in's eventual conquest of the whole of China and helped provide the labour for construction of the Great Wall. When the Han dynasty dissolved in 9 CE a long period of disunity followed. Around the 4th century a group of Turkic tribesmen, the Toba, moved into this region. They conquered the small weak north China states and assumed for themselves the ancient name of Wei. By 439, the Northern Wei had secured their territories from attack and unified all of North China. As so often happened in Chinese history the conquerors became seduced by Chinese luxury. Impressed by the aristocratic style and aura of distinction of Chinese nobles many families, including the imperial house, adopted Chinese surnames and endeavoured to rewrite history by disowning anything relating to their non-Chinese origins. Their enthusiastic adoption of Buddhism led to a backlash with suppression off monasteries and full scale persecution only to be followed by an emperor who reversed these trends. 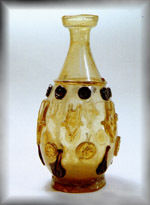 The greatest cultural contribution of the Wei dynasty was in Buddhist art. 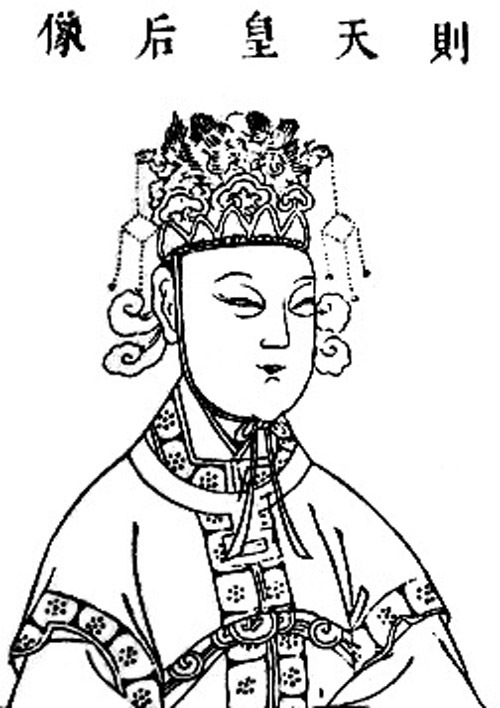 It is likely that several Wei emperors gave gifts to the temple. Unfortunately none still exist at Famen Si, but cave grottoes at Maji Shan, Yun-kang and Lung-men clearly show the high level of Wei art. Tradition relates that finger bones of the Buddha had been sent from India to China by the great emperor Ashoka [3rd cent BCE]. A reformed conqueror, his conversion to Buddhism was of great historic importance. 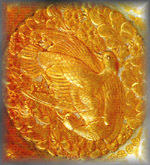 He encouraged the new faith throughout his lands as well as the wide distribution of Buddha's relics. 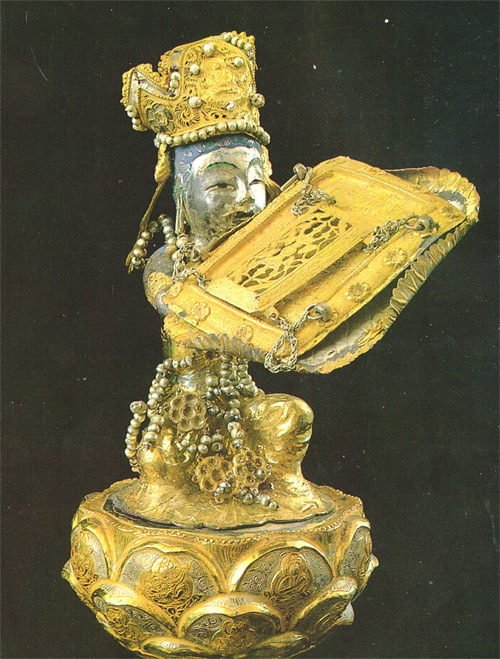 Relics, [sarira] in the form of bones were usually enshrined beneath a stupa. In India the stupa, which pre-dated Buddhism, was a large hemispherical mound with a central mast crowned by canopies. 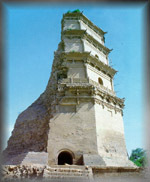 In China, the presence of Han dynasty multi-storyed watch towers probably influenced the development of the stupa, which transformed itself to become the Chinese pagoda. 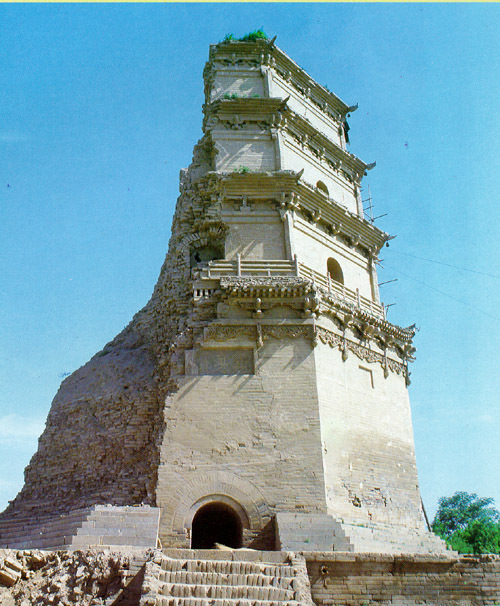 The temple of Famen was one of only four in all China which were supposed to contain actual relics of the historical Buddha and it is the only one where the actual structure and the relics have survived to the present day. Records state that here, during the reign of Emperors Huan and Ling of the Eastern Han [r.149 - 189 CE] , that a stupa with a crypt was built to shelter the relics of Lord Buddha. 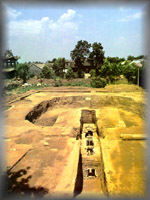 The archeological record does show this original structure which was probably assimulated into later construction during the Tang dynasty. Some two hundred years later, the Wei dynasty secured the place of Famen Si . In 495 CE the Wei ruler opened the crypt so that he could place sacrifical offerings to show his respect. From that time the fame of the temple spread far and wide. 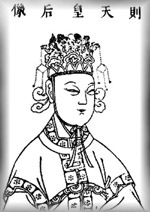 However, it was during the Tang dynasty (618 - 907 CE) that Famen Si reached its height of importance. 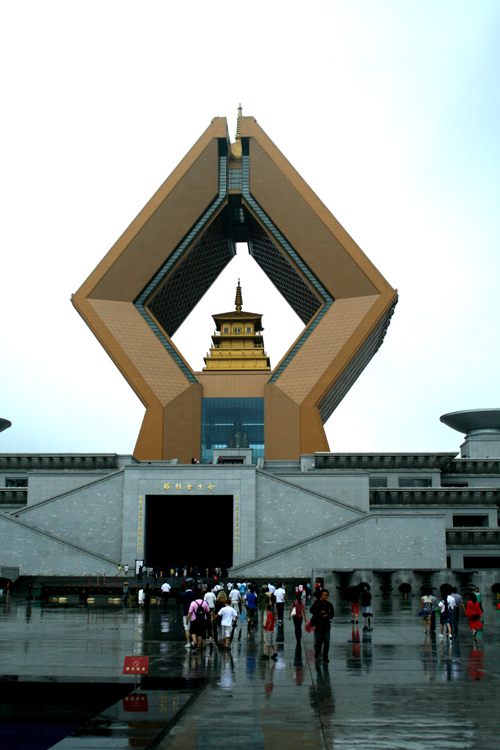 Because of its relics and because of its proximity to the royal capital at Chang-an [Xian]). In 625 it was formally renamed Famen Si [Temple of the Gate of the Law]. It was Emperor Li Shimin [Taizong r.626 - 649] who ordered the crypt to be opened so that the relics could be worshipped. Following Taizong's rule, seven emperors and one empress, the flamboyant Empress Wu, opened the crypt every thirty years. During each opening it is likely the rulers placed treasures within the crypt to honour the precious relics. So, when last sealed in 874 the crypt contained objects of the very highest value and quality that Tang artisans could create. During most of the recorded openings, the relics were brought in ceremonial procession to the capital. 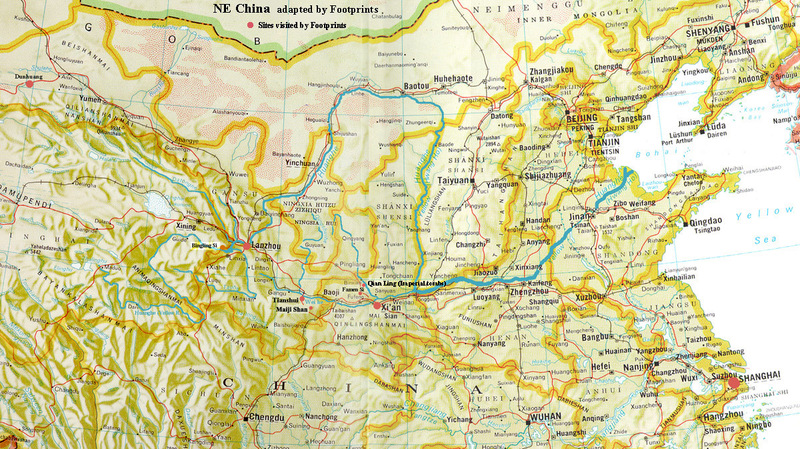 The distance to Chang-an [Xian] is 120 kilometres, so the journey must have lasted several days. 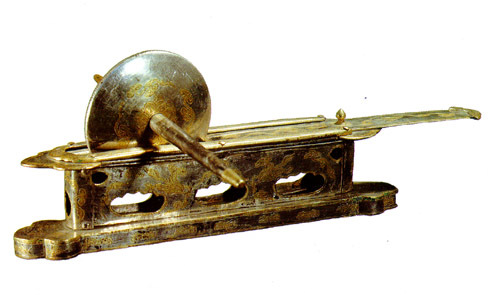 The relic, decorated with gold, jade, silk and jewellery, would be transported in imperial carriages. There was considerable religious frenzy as individuals competed to donate the most precious items to monasteries and to make offerings to the relic. Gold and jade decorated piles of earth built to form incense posts along the route. Such spectacularly public devotion would have been recognised as bringing great merit to the donors as well as being an enormously popular public spectacle. However, there was tremendous cost to individuals and the state as monasteries and clergy were exempt from taxation; and wealth in the form of gold, silver and bronze images was sequestered in the temples. Now the Buddha was of barbarian origin, His language differed from Chinese speech; his clothes were of a different cut; his mouth did not pronounce the prescribed words of the Former Kings, his body was not clad in the garments prescribed by the Former Kings. ..... now that he has long been dead, is it fitting that his decayed and rotten bones, his ill-omened and filthy remains, should be allowed to enter in the forbidden precincts of the Palace?... I pray that Your Majesty will turn this bone over to the officials that it may be cast into water or fire, cutting off for all time the root and so dispelling the suspicions of the empire and preventing the befuddlement of later generations. Han's criticism enraged the emperor Xianzong (r 805-820). As a supporter of Buddhism he was particularly miffed by the assertion that all dynasties which supported Buddhism were short-lived. (which was factually incorrect!) He ordered the death of Han Yu but was persuaded to commute this to demotion and expulsion to a remote province. It was not for another twenty years that suppression of Buddhism was undertaken and then only briefly. By the middle 9th century however, although Buddhism remained the main religion of China its period of greatest influence and popularity was over. 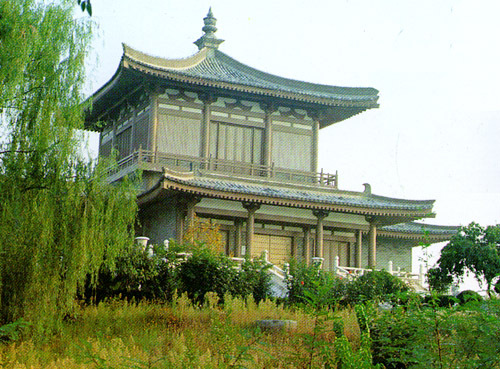 In 874 during the reign of Emperor Xizong, the practice of opening the Famen tomb stopped. Engraved stone tablets were placed to record this last sealing and the crypt was closed. 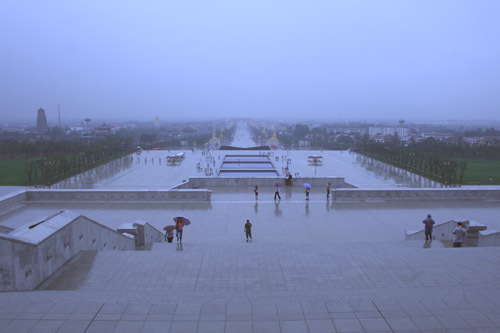 For centuries, Famen Si remained a notable site but the presence of the relics, the public worship by imperial rulers and their associated treasure faded from memory. 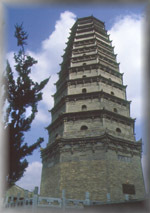 During the Ming dynasty, seven hundred years later, its importance was acknowledged by constructing a thirteen storey brick pagoda. That was in 1579. 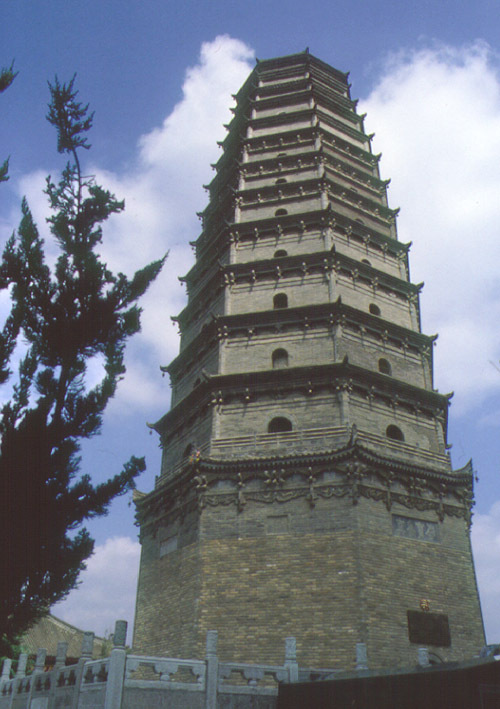 Earthquake damaged the pagoda in 1654 which was left un-repaired until 1939. The passage of time and general state of dis-repair meant that the greater significance of the site was forgotten, and this lapse of memory continued. 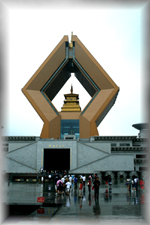 During heavy rains in 1981 one side of the Ming pagoda collapsed again. Renovations were started in 1987 and, quite by chance, a three-chambered underground palace was discovered directly beneath the pagoda. 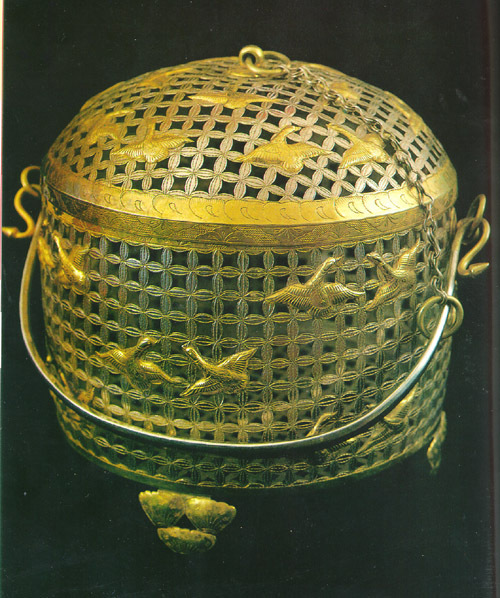 Acheological investigation confirmed a Tang construction with its treasures and relics, all of which had been undisturbed and forgotten for 1,113 years. The rarity and quality of these treasures and the presence of sarira make the re-discovery of Famen Si an acheological milestone. 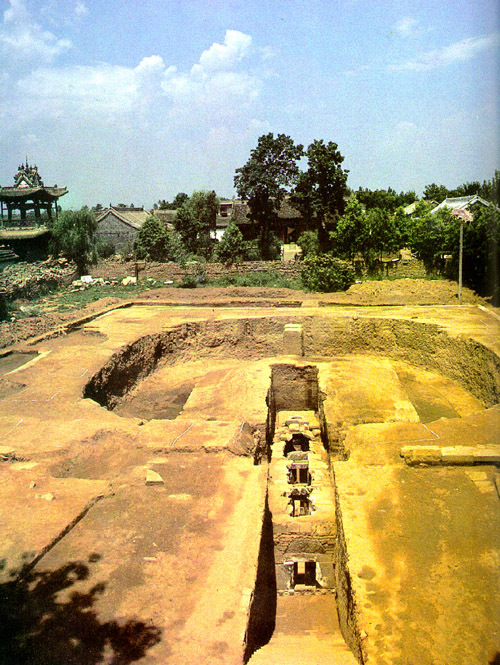 The structure of the underground palace reflected the form of Tang royal tombs. It is orientated along a north-south axis and features a long sloping underground approach corridor at the bottom of which is placed an epitaph tablet. Then follows a level corridor and series of doors leading to three chambers. The corridor and chambers cut through the foundations of the co-existing original Tang square wooden pagoda. 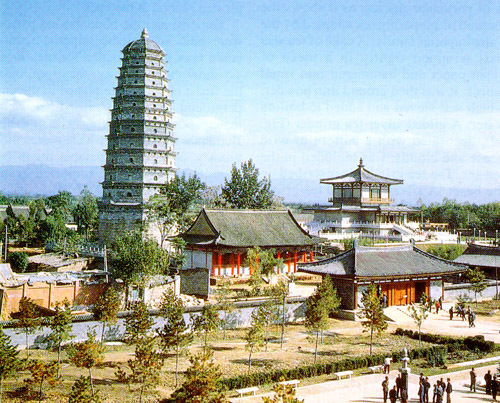 When the Ming constructed their octagonal pagoda they cut into the Tang foundations but did not disturb the underlying older structures as they were probably unaware of their presence. 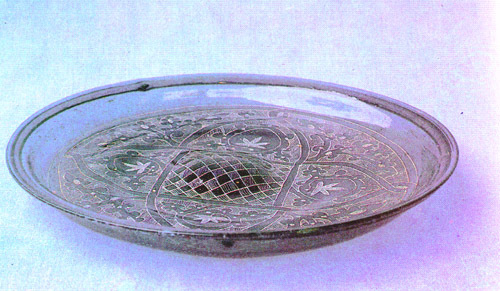 The Tang marked the high point in the manufacture and use of gold and silver ware. Being easily convertible, much of gold and silver which existed during the heyday of the empire must have been melted down. It is fortunate that the hoards which were buried at times of rebellion and those in religious crypts such as Famen si have been discovered undisturbed during the twentieth century. The re-discovered Tang chambers at Famen contained a wealth of previously unknown artefacts together with extensive documentary records. Most were contained in the farthest, northern chamber and most were probably placed there during the final closure in 874, as several of them bear dates to that effect. Four separate groups of sarira were found. Each was enclosed within a series of small nested caskets. 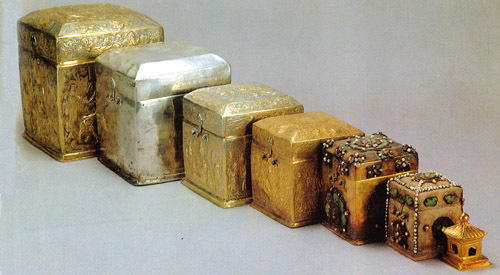 The caskets were of gold, or silver or jade, with many elaborately decorated. There were three sets of 'decoy' caskets placed throughout the tomb. Each decoy set was more sumptuous than that which contained the genuine sarira (a finger bone). The authentic group of caskets was concealed in a hidden niche in the rearmost chamber. 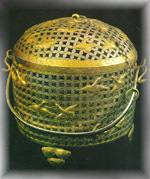 The other three sets are considered 'shadow bones', a device to protect the genuine sarira from destruction in the event of Buddhist persecution. 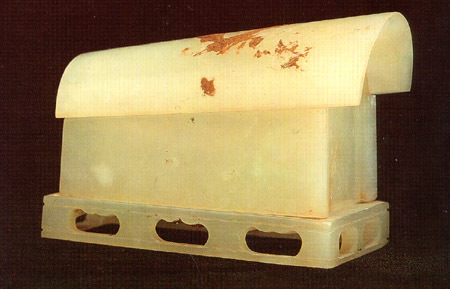 The innermost casket in the genuine set is made of white jade. 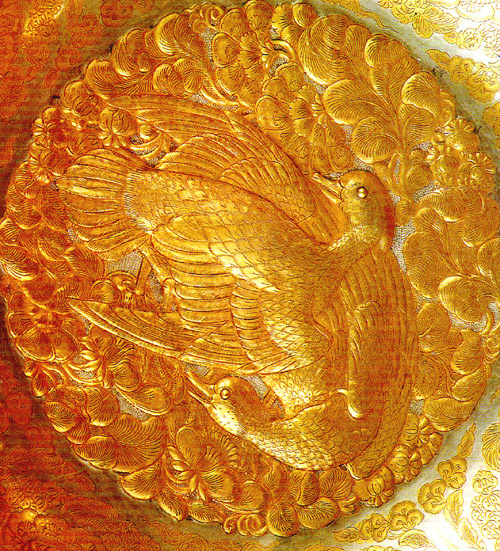 On its lid are traces of gold-lined embroidered silk with which it had once been wrapped. 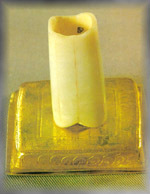 Inside there is a platform on which the Buddha's finger bone was placed. Of particular interest are the nineteen mi se [hidden colour] celadon wares. The Famensi discover was the first time this glassy, translucent, bluish-green glaze had been seen. This glaze was long known from the literary record but what it looked like had remained obscure as their use was strictly confined to the court. 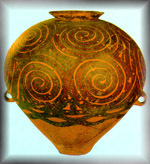 During the eighth century green pottery ware became more popular than white. 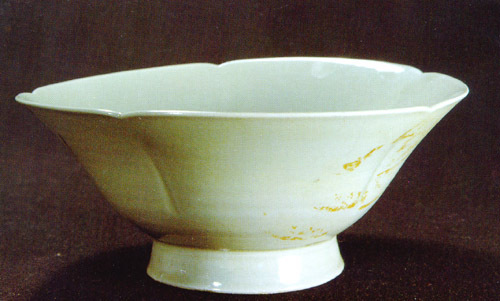 As tea drinking became more fashionable, connoisseurs concluded that the green-glazed porcelains from Yue enhanced the colour of green tea and its jade-like appearance was praised by poets. 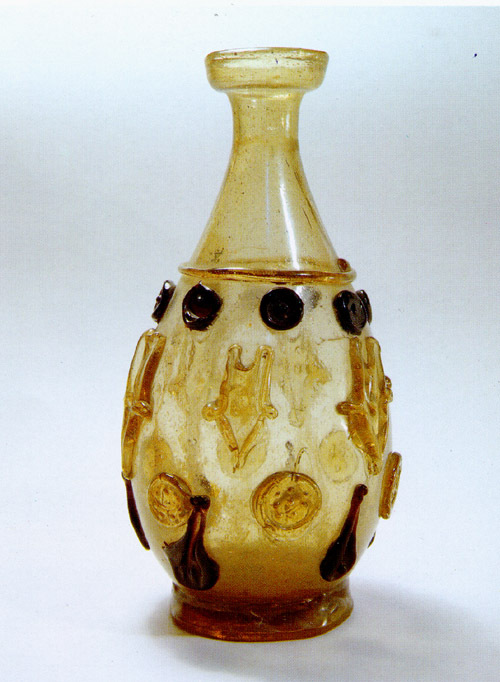 The presence of fourteen mise wares at Famen highlighted the changed status of ceramic which only in Tang times began to rival gold, silver and bronze as a prized material. 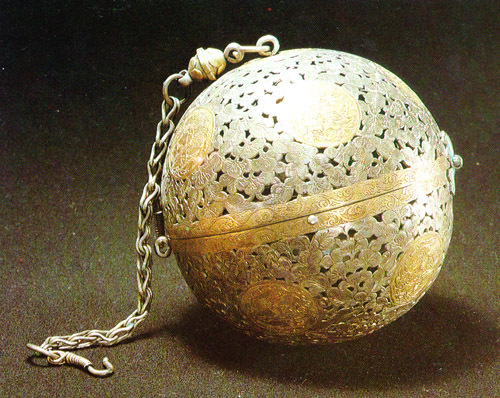 Persian Gulf sea-water pearls adorn a gilded silver statue made in 871 to present the finger bone for the Emperor Xizong to worship on his birthday. 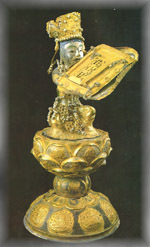 The relice was placed between the lotus-leaf plates in the hands of this bodhisattva. An inscription requests that: ..the holy life span be ten thousand Springs, the holy one's branches have ten thousand leaves, the eight barbarians come to submit, the four seas have no turbulence. At age 37 Xizong (r 873-888) was a fervent Buddhist, raising military costs and imposing special taxes to pay for Buddhist temples. It is said that having seen this image he could happily die. Within two years he did indeed die, probably as a result of ingestion of 'immortality' elixirs! 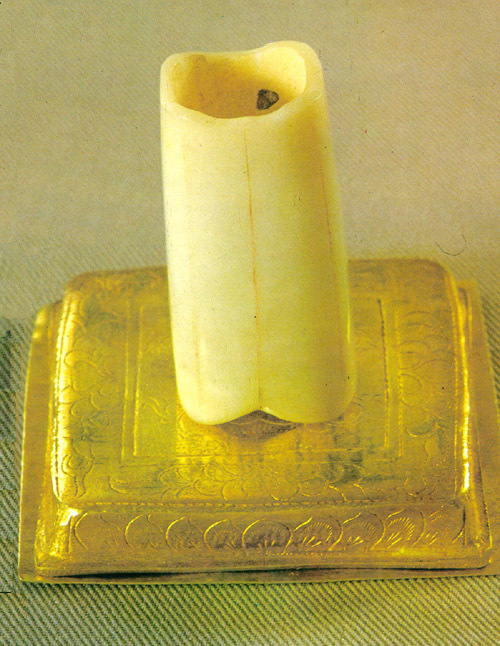 In 873 Xixong was the last emperor to bring the Buddha's finger bone back to the imperial palace in Chang'an. It is a jewel of Western countries, and is akin to jade and other stones. It is born within the earth, and some say that it is water transformed after a thousand years; still this is not necessarily so. In addition to gold, silver and glass, a range of textile fragments from regions outside China were also found. However, conditions in the crypt were not conducive to good preservation of fabrics. We, fortunately, do not have to wait that long to make our own assessment of the glories contained in the Temple of the Gate of the Law. In the 1990s, with assistance from Japan, a group of tasteful small museum buildings were built to display these treasures. Lying in a small compound, directly accessible to the local village. Famen is two hours drive from Xi'an, off the usual tourist trail, so the temple and its museum was mostly visited by small numbers of interested Chinese, and by Japanese groups keen for a first-hand experience of a Buddha relic. It was during, a quiet and dignified place. In 2007 work started on a 'redevelopment' - massive even by Chinese standards. Adjacent to the older buildings, a completely new temple was constructed. At the end of a 1km paved accessway a pair of five-storey high meditating hands sit above a similarly impressive golden statue of the Buddha. Along this accessway, golden statues of attendant Boddhisatvas mimic the attendants of imperial tombs. It is immense and breathtakingly grand. And its depressing. A symbiosis of mammon and religion, that aspires to awe and instead leaves an impression of Buddha's religion on an overdose of speed. Despite the fact that this is definitely not the 'middle way' one cannot help but be impressed and that is surely the intention of the builders. I am impressed by the giganticness of it all and by the, perhaps cynical, intention of the Chinese authorities that they are seen to be supporting Buddhism. That tourists are coming in large numbers is very evident. The 1990s complex attracted perhaps a few hundreds each day, now there are many thousands. One has to hope that a more subtle message will be imparted than the one that is so obviously on show. The new complex is walled off from the surrounding village so that villagers can no longer provide snacks, food or simple curios to visiting pilgrims. Those needs are now serviced in the glistening shops at the new entrance. Famen Ci has been re-invented. The history, the sarira, and the glorious works of Tang craftsmen are still there amidst the glitz. So - go to Famen Ci it remains a great and special place. Peter Neville-Hadley, China, the Silk Routes, Cadogan, 1997. 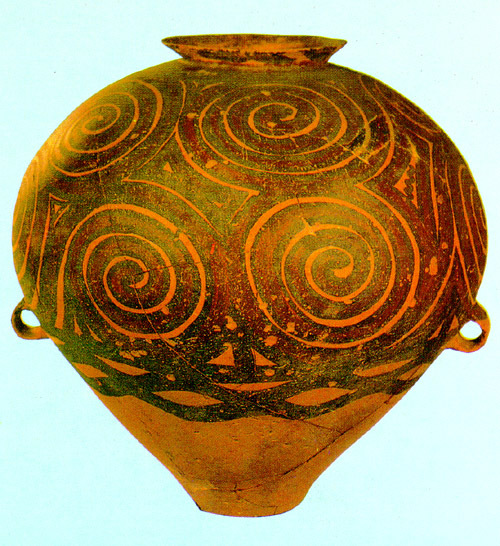 Precious Cultural Relics in the Crypt of Famen Temple, Shaanxi People's Fine Art Publishing House, 1994.